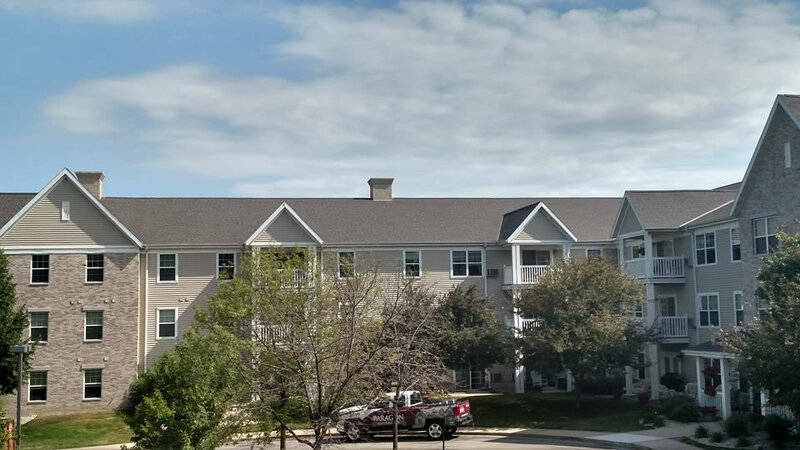 Paragon Exteriors LLC And A Large Condo Roof Replacement Project We Recently Completed. Do you own, manage, or maintain a residential development or multi-family structure such as a condo, townhome, home owner association, or apartment building? Many of these structures that were built 15+ years ago are starting to experience the standard maintenance issues with their buildings and one of those items in need of replacement is the roof. The roofing process on a condo or large multi-family structure is an involved project and is much different than how a normal residential home is done. There is enormous amount of planning that needs to be done and the cost involved for materials and labor on such a large structure is significantly higher. Instead of only one decision maker with a single family home there are many decision makers involved with a townhome or condo roof replacement. There are often numerous meetings, and the logistics involved is enough to scare many roofing companies. Paragon Exteriors has many years of experience and many large condo roofing projects under our belts. We offer fair pricing and make the process easy. 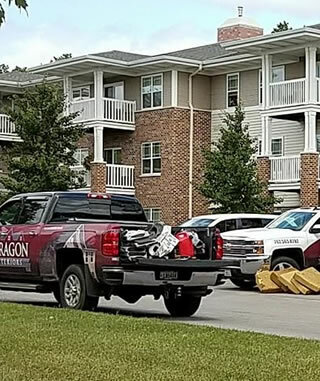 Our Equipter eliminates large piles of debris on the property and allows the dumpsters to be placed where it is convenient for you instead of us. We are able to staff projects accordingly so we are able to get them completed in a quick time frame and our dedicated project manager makes these large projects go smoothly. 1. Are there any known leaks or major areas of concern? 2. Is there a specific material required to be installed? 3. What is the time frame for starting the project? 4. Where could we place the dumpsters and the materials (if the materials cannot be roof loaded)? 5. Who will be our main point of contact for your project? These are all important questions that could affect the final proposal price for the project. If there are major known problems, we may need to use more materials in a certain section or spend more time making repairs than laying down new shingles. If you are looking for a more expensive material such as a laminated or dimensional shingle, it will of course increase the price as well. If you aren’t looking to start the project for a year but want to get pricing now, the prices could increase simply due to inflation and a changing roofing material market. While the actual installation of the roof goes fairly quick, the decision process to go ahead and actually get the roof completed can often be long. Replacing the roof on a condo or townhome is an expensive project that is often in the six figure price range. It can take up to two months just to get the amount of materials required to be able to complete the job so it is always best to decide to do these projects no later than the month of August in any given year in order to be able to get the job done before the year ends. If you are starting your search for a roofing company to safely, properly and effectively complete your condo or townhome roofing project, meet with us and we can show you how we can make this a stress and hassle free experience for everyone involved. Roofing a large structure (or many structures) in multi-family dwellings can be very complex projects depending on many factors such as the pitch of the roof, accessibility, material handling and the actual roof lines themselves. There are many roofing contractors who would rather concentrate on the simpler projects such as re-roofing single family homes than take on a behemoth sized project like a 50+ unit condo building development. Paragon Exteriors is a roofing company serving the Waukesha area. We specialize in the larger, more challenging roofing projects such as those for a home owners association, strata corporation or other type of residential development with a large roof and strict requirements. We have the equipment, the knowledge, the people and the managerial skills to take on these large projects whether it's the replacement of the entire roof, replacement on specific units or just some roofing repairs after a storm or bad weather. The first step in the process is to give us a call so one of our roofing experts can come to your site for a roofing inspection. We need to look at the roof, the roofing material, all around your flashing and any dormers. We're looking for clues that an untrained eye might miss such as hail damage, shingles lifting or cracking, poorly installed flashing (or sometimes none at all), roof venting and we're even going to be looking around the gutters too for signs of water intrusion or damage from ice dams. If your condo, townhome or residential buildings are more than 15-20+ years old and has asphalt shingle roofing that has never replaced then it's a prime candidate to consider for replacement. If your roof begins to leak or cause water damage to your building and or the individual residences the problem can get drastically more expensive to deal with. Having to replace your roof is generally something that most condo associations are prepared for in form of an emergency repair fund or planned maintenance costs. Paragon Exteriors LLC can work with your budget to help you select the most appropriate roofing material for your building. From affordable asphalt shingles to more luxurious dimensional or architectural shingles we'll be able to make sure your new roof is installed properly and will last for many years. Paragon Exteriors LLC standard repair policy does not give estimates on repairs on anything we believe would be under $750.00 (minor repair). We base our normal repair policy charges on a “Time & Materials” basis. There is a minimum service call charge of $345 for the first hour and $115 per hour per two man crew for each hour after with cost not to exceed $500.00. Rates cover minor materials as well as trip charge time to secure the proper materials for your specific repair. Note: For EMERGENCY service calls on weeknights, weekends and holidays the standard charge is $400 for the first hour and $150 for each hour after per guy, not to exceed $1000.00. Rates also cover minor materials. Payment is mandatory at the time of service by check or can be charged to a credit card to secure the repair. Rainy Days - If the repair is too extensive to remain under $750.00 the repair person will tarp the leak are and/or make a temporary repair at the minimum charge if interior water damage is occurring. A formal quote will be given and must be approved before any further work takes place. Dry Days - If the repair is too extensive to remain under $750.00, the repair person will provide a free estimate to be approved before starting any work. All repairs where charges would be less than $750.00 will begin immediately and services will be charged. Paragon Exteriors LLC will not guarantee repairs on projects not originally installed by Paragon. This is due to many factors, which may contribute to the source of the leak. If the “fix” does not solve the problem, a repair person will return to assess the problem. If we missed an obvious problem, there will be no additional charges. If the leak is not obvious, additional charges will be billed as a continuation of the original repair. Once a repair work order is created, a repair person will call the day before or day of the repair depending on our workload to schedule the repair. This is a one-on-one communication with the actual repair person assigned to conduct the repair. If necessary, you may at this time cancel service to avoid any charges or request a specific day and time that works around your schedule and have the repair made. Why Choose Paragon Exteriors LLC For Roofing Services For Your Condo or Townhome Development? Choosing the right roofing company to replace or repair your roof on a building as large as a condo or a townhome is a big decision and you want to be sure you're choosing a company that can make this process as hassle free as possible. #1. Clear and concise communication.